Generations of Canadian Music 2017: BC Composers | Oak Bay Music: Chamber Music Concerts Victoria B.C. The Victoria Composers Collective, Oak Bay Music and special guests are launching a new concert to celebrate diverse generations of Canadian classical music. As part of a broader performance which aims to reach music from each province of the country, this November 2017 concert will feature composers who are born or resident in British Columbia, including pieces by Rudolf Komorous, Sylvia Rickard, Christopher Butterfield, Jocelyn Morlock, and emerging composers from Victoria and Vancouver. 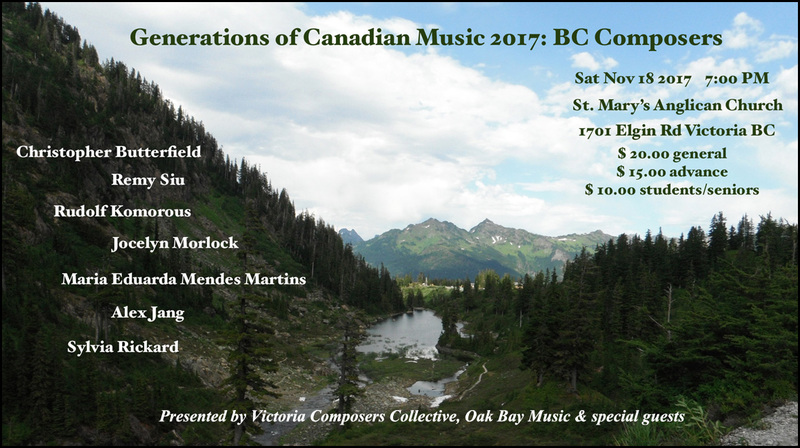 Generations of Canadian Music 2017: BC Composers will happen on November 18th 2017 at St. Mary’s Anglican Church, as part of Oak Bay Music concert series, and will feature Cathy Fern Lewis, Kimberley Manerikar, Maria Wang, Josh Layne, Maria Eduarda Mendes Martins and Hollas Longton as performers of such wonderfully intriguing pieces! Come celebrate Canadian classical music throughout the 20th and 21st centuries with us! Advance tickets (General $15 / Students & Seniors $10) available online, and at Ivy’s Books (2188 Oak Bay Ave).